Alexandra Penfold is a Literary Agent with Upstart Crow Literary Agency and the New York Times Bestselling author of All Are Welcome, illustrated by Suzanne Kaufman. She represents works for all age ranges and across genres. Some of the books Alexandra has represented include SCBWI Golden Kite winner Boats for Papa by Jessixa Bagley (Roaring Brook), Be the Change by Arun Gandhi and Bethany Hegedus, illustrated by Evan Turk (S&S), and the 2017 Jumpstart Read for the Record Book, Quackers by Liz Wong (Knopf). Clients include New York Times Best Selling illustrator, Elizabeth Baddeley, Meghan McCarthy, Adam Lehrhaupt, and Suzanne Kaufman, among others. 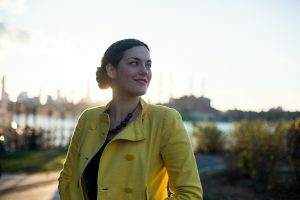 In addition to her work as an agent, Alexandra is the author of several books for children: Eat, Sleep, Poop, illustrated by Jane Massey, We Are Brothers, We Are Friends, illustrated by Eda Kaban, The Littlest Viking, illustrated by Isabel Roxas, and Food Truck Fest, illustrated by Mike Dutton. Find her on Twitter @agentpenfold or www.alexpenfoldbooks.com. This session will go over strategies for revision with real life examples from published books. Attendees: Please prepare for the class by making a list of your 5 favorite picture books. At least 3 of the 5 must be from the past 5 years. Write out what you think the overarching theme is and what elements of the story: plot, characters, dialogue, humor, etc that made it a favorite for you and why. hands-on exercise. We’ll go over the anatomy of an engaging picture book and talk about how pacing and page turns come together to create stories that demand repeat reads.